Victory to the Storm Crows! This morning I was greeted my the news that I had won a prize in the latest ‘Shell Case Shorts’ short story competition with my piece on a Space Marine chapter know as the Storm Crows. As promised with April’s Shell Case Shorts, and entirely due to the generosity of Nick Kyme I was able to offer 3 prizes. The top spots receive signed copies of the Fall of Damnos and Salamander. The honourable mention gets a signed copy of the thinner but no less awesome Back from the Dead. All three entries deserve get posts so there will be three separate ones, so hold on to your butts. There were some great entries but sadly some couldn’t be considered as they were written as stories rather than histories which was the point of the origins emphasis. However, as it seems to have sparked the imagination of so many of you I will be holding a second Origins based Shell Case Shorts during the summer. The first winning entry is Chris Spurgeon (@Chris_S_79) for his rather compelling piece on the Space Marines Chapter known as the Storm Crows. The rumours about the upcoming Chaos Legions Codex for Warhammer 40,000 has got me thinking. As I observed in my previous post, the challenge with this codex will be to incorporate sufficient options into a single list to allow the different characteristics and distinct troop types of the nine original Traitor Legions to be fielded while still allowing a balanced and flexible list. It remains to be see if this is an achievable goal, but I am currently hoping that the GW Studio can do it without having to resort too much to variant lists. I have a deep dislike of variant lists, either within a Codex – such as those in the 3.5 edition Chaos Codex – or added in supplementary material – such as those included in the the ‘Index Astartes’ articles that GW published in White Dwarf about ten years ago. I have several objections to the use of variant lists. The first is simply that they are often not as well play-tested as the parent list as as such often not as well balanced – often resulting in overpowered builds. More importantly though, I think variant lists are too often based on a fairly narrow interpretation of a sub-faction’s background and character. Often picking up on one characteristics and exaggerating it or being based on popular stereotypes about a certain faction. This has the effect of further reinforcing those stereotypes. The most obvious example is the ‘all bikes, all the time’ interpretation of the White Scars Space Marine Chapter. Until the 5th edition codex provided a timely reminded that the White Scars are in fact a Codex Chapter, comprising largely of Battle Companies they were widely regarded in the popular imagination as being an all-bike force and White Scar players who fielded bike-light forces were regarded as not following the fluff, when really they were showing respect for the full extent of the fluff beyond the lazy stereotype that had been encouraged. Similarly, the issue of whether it is ‘fluffy’ to include units other than Wraith Guard and Wraith Lords in an Iyanden Craftworld depends very much on how strongly the ‘only construct troops’ stereotype has been inculcated with you and your local gaming group. The flip side of this is that parent lists are often inappropriately restricted in order to allow the variant lists to have some justification and identity. It is only since the 5th edition Codex for example that Space Marine Chapters other than the White Scars ever got to really use their bike companies. Similarly, in the previous Chaos Codex, only the Iron Warriors had access to the Vindicator, despite that having been a design in use since the Great Crusade. I don’t want to be dismissive of the important distinctions of history, tradition and character that exist between different Chaos Legions, Ork Clans, Eldar Craftworld and Space Marine Chapters. But I think that quite often the question needs to be asked whether these differences translate into differences that are meaningful on the tabletop and genuinely demand a separate list, and whether appropriate rules can be allocated that reflect the background. 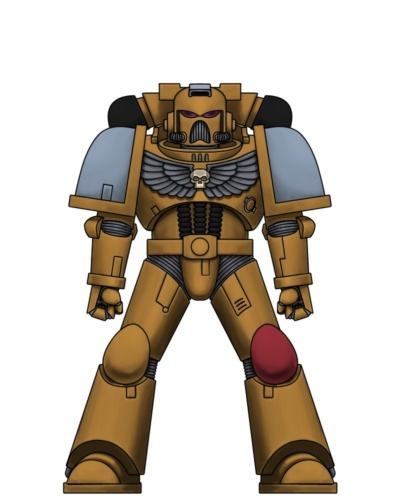 For example, which the Imperial Fists have a long and illustrious history and a distinct character, but I’m not convinced that anything in that translates into anything that should set them apart on the tabletop from the Ultramarines, and I don’t think that giving them the ‘Tank Hunters’ rule appropriately reflects their tradition of expert siege craft. So my position is basically that variant army lists should be avoided. If a sub-army is genuinely different enough it should be developed into a full Codex. Otherwise it should be reflected in the core army list. Of course, at the moment the only variant armies that currently have their own Codexes are Space Marine Chapters. I know this is a controversial fact in some quarters. I understand the frustration of non-Imperial players that so much attention is lavished on the Space Marines, though it is a common aspect of all science fiction and fantasy literature that the human faction(s) are much more fully explored than the aliens – though that might be because the humans are more usually the protagonists. To be fair, the Space Marines do lend themselves to breaking down into multiple Codexes, as in contrast to other factions at large in the grim darkness of the far future a Space Marine Chapter represents a relatively small, distinct, insular and rigidly organised force. In contrast, even the Imperial Guard represents a much more heterogeneous and diverse organisation and an army could even be a fusion of the remnants of several defunct regiments from several different worlds. Similarly an Eldar Craftworld probably commands significantly greater resources than a single Space Marine Chapter, but warhosts are probably assembled and organised in in much more ad hoc manner than the Astartes. So it is possible to create codex lists which define the resources of a specific Space Marine Chapter in a way that isn’t really possible for other forces as there is much more room for variation and exceptions in other factions. The GW design studio have done a fairly good job in recent years in developing what makes ‘non-Codex’ chapters distinct and making sure that the army lists are genuinely different enough to make each Codex just about worth the extra £20 you have to shell out. The challenge of the next year or so will be to see if GW can develop a new Dark Angel Codex that is the equal of the recent Space Wolf and Blood Angel Codexes. I know that some people have expressed the view that individual Chapters should not have their own Codexes and should be folded back into a single book. This seems like a backward step to me and I think this overlooks both the extent of the work done to differentiate the non-Codex Chapters, and exactly how long some of the varient rules have existed – many of them actually date back to First Edition. I understand the frustration of players with armies other than Space Marines. There is, strictly speaking, nothing to stop GW developing – for example – specific Eldar Craftworld Codexes, but this would require quite a lot of distinctive background to be developed from whole cloth (not that there’s anything wrong with that). The difficulty will not be identifying what – again for example – a Biel Tan army should have, but why other Craftworlds can’t have the same things, and what Biel Tan cannot have to balance out their advantages. From a more practical point of view, it might also be logistically more difficult to supply the models for an alternative Eldar army as it would require more than a new set of specialised accessories to add to existing models. Ork Clans could be approached in a similar way, though there is the additional complication that an Ork Waaaaagh tends to be made up of a mixture of Clans, which takes us back to a single list that can be used to represent either a single clan force or a mixture. The question ultimately would be if – for example – a Bad Moonz only army would have access to units that Bad Moonz would not deploy when fighting alongside other Clans. This is a tricky question that impacts on how GW develop their range of armies and army Codex books. At present I think they are proceeding on about the right course, sticking to a single Codex except where a sub-army is well developed enough to justify an whole separate Codex. I will be interested to see how GW handle things in the upcoming Chaos Legions book, and whether they will convince me that there is a third way between these approaches. The Space Wolves were my first Warhammer 40,000 army, so when the 5th Edition Codex came out I inevitably bought it out of nostalgia. The army list is a good one so I did play around with some ideas. After I came up with the Brazen Angels, I thought of other ‘DIY’ Chapters I could do. One of the ideas I liked was the ‘Battle Dogs’ who I envisage as a Chapter with swashbuckling, even piratical traditions. I’ve never done much with Drop Pods before so I had a go at a drop list. Eagle eyed readers will notice that there are not enough Pods for everyone. I envisage the Lord and his power armoured retinue scouting on their own, then summoning the rest of the force when the target is sighted. I included some Land Speeders because I’ve never really used them before and thought they fit the theme. Wolf Lord (185) WS6·BS5·S4·T4·W3·I5·A4·Ld10·Sv3+ frost axe; close combat weapon; runic armour; frag grenades; krak grenades; melta bombs; wolftooth necklace; Belt of Russ. And They Shall Know No Fear; Independent Character; Acute Senses; Counter-attack. 5 Wolf Guard (290) WS4·BS4·S4·T4·W1·I4·A2·Ld9·Sv3+ 3× bolt pistol; 3× chainsword; 5× Terminator armour; 5× thunder hammer; 1× storm shield. And They Shall Know No Fear; Acute Senses; Counter Attack; Pack Leaders. Drop Pod BS4·FA12·SA12·RA12 storm bolter. Vehicle (open-topped); Inertial Guidance System; Immobile; Drop Pod Assault. 5 Wolf Guard (205) WS4·BS4·S4·T4·W1·I4·A2·Ld9·Sv3+ 3× bolt pistol; 1× plasma pistol; 1× wolf claw; 3× power weapon; 1× wolf claw; 1× power fist; 5× power armour; frag grenades; krak grenades; 5× melta bombs. And They Shall Know No Fear; Acute Senses; Counter Attack; Pack Leaders. Dreadnought (175) WS4·BS4·S6·FA12·SA12·RA10·I4·A2 plasma cannon; Dreadnought close combat weapon (built-in storm bolter); smoke launchers; searchlight; extra armour; wolftooth necklace. Vehicle (walker). 10 Grey Hunters (215) WS4·BS4·S4·T4·W1·I4·A1·Ld8·Sv3+ meltagun; meltagun; power fist; power armour; close combat weapons; boltguns; bolt pistols; frag grenades; krak grenades. And They Shall Know No Fear; Acute Senses; Counter-attack. 10 Grey Hunters (205) WS4·BS4·S4·T4·W1·I4·A1·Ld8·Sv3+ meltagun; meltagun; power weapon; power armour; close combat weapons; boltguns; bolt pistols; frag grenades; krak grenades. And They Shall Know No Fear; Acute Senses; Counter-attack. 10 Blood Claws (230) WS3·BS3·S4·T4·W1·I4·A1·Ld8·Sv3+ meltagun; plasma pistol; power fist; power armour; close combat weapons; bolt pistols; frag grenades; krak grenades. And They Shall Know No Fear; Acute Senses; Counter-attack; Berserk Charge; Headstrong. 3 Land Speeders (270) BS4•FA10•SA10•RA10 3× heavy bolter; 3× assault cannon. Vehicle (fast; skimmer); Deep Strike. 6 Long Fangs (220) WS4•BS4•S4•T4•W1•I4•A1•Ld9•Sv3+ 5× missile launcher; power armour; close combat weapons; frag grenades; krak grenades. And They Shall Know No Fear; Acute Senses; Counter-attack; Fire Control. +1 Squad Leader WS4•BS4•S4•T4•W1•I4•A2•Ld9•Sv3+ power fist; bolt pistol; power armour; frag grenades; krak grenades. And They Shall Know No Fear; Acute Senses; Counter-attack; Fire Control. • Drop Pod BS4•FA12•SA12•RA12 deathwind missile launcher. Vehicle (open-topped); Transport Capacity: 12 models or 1 Dreadnought; Inertial Guidance System; Immobile; Drop Pod Assault. I’ve posted once or twice about my Brazen Angels Space Marine army. But I’m not sure if I ever posted the army list. This is the 2000 point list I worked out when I decided to round out the collection. As some of you may know I originally planned a 3000 point list, which was similar to this but with lots of Land Raider dedicated transports (and a Razorback for the Devastators) added. It also had two Sanguinary Priests, one to support the Assault Squad and one to accompany the Tactical Squad riding the Storm Raven. In this army, the squad with the melta weapons goes in the gunship for opportunistic tank-hunting while the gunship also acts as a general mobile reserve, as does the Baal Predator. The Predator Annihilator provides dedicated anti-tank support. The Chaplain will lead the Assault Squad to maximise their destructive potential. The idea of an all-missile launcher Devastator Squad originally came from @CaitoGalenus. I’ve used such squads in the past and they are surprisingly effective. Captain (135) WS6·BS5·S4·T4·W3·I5·A3·Ld10·Sv3+ Iron Halo; power sword; plasma pistol; melta bombs; power armour; frag grenades; krak grenades. And They Shall Know No Fear; Independent Character. Chaplain (145) WS5·BS4·S4·T4·W2·I4·A2·Ld10·Sv3+ Crozius Arcanum; rosarius; plasma pistol; melta bombs; power armour; frag grenades; krak grenades; jump pack. Independent Character; Honour of the Chapter; Liturgies of Blood. 9 Tactical Marines (200) WS4·BS4·S4·T4·W1·I4·A1·Ld8·Sv3+ plasma gun; missile launcher; power armour; boltguns; bolt pistols; frag grenades; krak grenades. And They Shall Know No Fear; Combat Squads; The Red Thirst. +1 Space Marine Sergeant WS4·BS4·S4·T4·W1·I4·A2·Ld9·Sv3+ chainsword; plasma pistol; melta bombs; power armour; frag grenades; krak grenades. And They Shall Know No Fear; Combat Squads; The Red Thirst. 9 Tactical Marines (195) WS4·BS4·S4·T4·W1·I4·A1·Ld8·Sv3+ meltagun; heavy bolter; power armour; boltguns; bolt pistols; frag grenades; krak grenades. And They Shall Know No Fear; Combat Squads; The Red Thirst. +1 Space Marine Sergeant WS4·BS4·S4·T4·W1·I4·A2·Ld9·Sv3+ bolt pistol; power weapon; melta bombs; power armour; frag grenades; krak grenades. And They Shall Know No Fear; Combat Squads; The Red Thirst. 9 Tactical Marines (195) WS4·BS4·S4·T4·W1·I4·A1·Ld8·Sv3+ meltagun; multi-melta; power armour; boltguns; bolt pistols; frag grenades; krak grenades. And They Shall Know No Fear; Combat Squads; The Red Thirst. 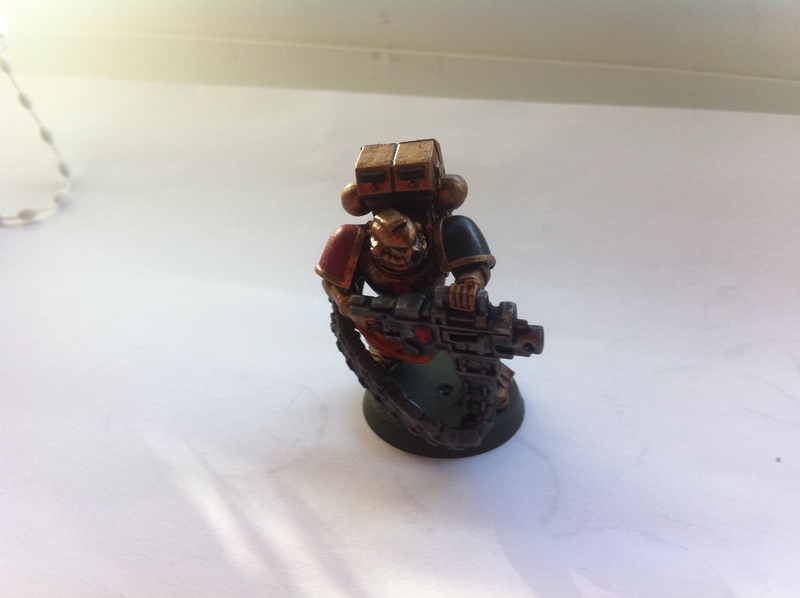 +1 Space Marine Sergeant WS4·BS4·S4·T4·W1·I4·A2·Ld9·Sv3+ bolt pistol; plasma pistol; melta bombs; power armour; frag grenades; krak grenades. And They Shall Know No Fear; Combat Squads; The Red Thirst. 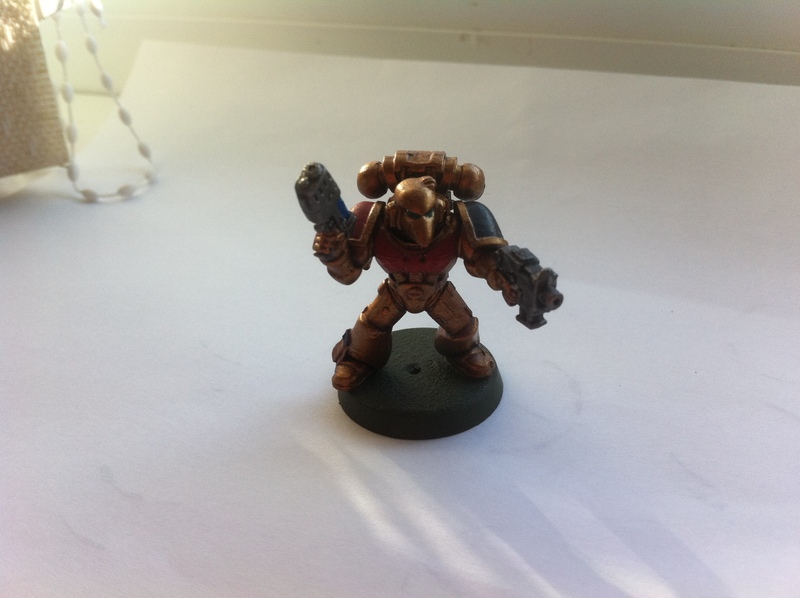 9 Assault Marines (250) WS4·BS4·S4·T4·W1·I4·A1·Ld8·Sv3+ plasma pistol; jump packs; power armour; chainswords; bolt pistols; frag grenades; krak grenades. Jump Infantry; Descent of Angels; And They Shall Know No Fear; Combat Squads; The Red Thirst. +1 Space Marine Sergeant WS4·BS4·S4·T4·W1·I4·A2·Ld9·Sv3+ bolt pistol; power fist; melta bombs; power armour; frag grenades; krak grenades. Jump Infantry; Descent of Angels; And They Shall Know No Fear; Combat Squads; The Red Thirst. Baal Predator (146) BS4·FA13·SA11·RA10 twin-linked assault cannon; sponson heavy bolters; searchlight; smoke launchers. Vehicle (tank, fast). Predator (181) BS4·FA13·SA11·RA10 twin-linked lascannon; sponson lascannons; smoke launchers; searchlight. Vehicle (tank). Stormraven Gunship (231) BS4·FA12·SA12·RA12 twin-linked heavy bolter; twin-linked assault cannon; 4 blodstrike missiles; ceramite plating; side-sponson hurricane bolters; searchlight. Vehicle (fast; skimmer); Assault Vehicle; Deep Strike; Power of the Machine Spirit; Skies of Blood. 4 Devastators (135) WS4·BS4·S4·T4·W1·I4·A1·Ld8·Sv3+ 4× missile launcher; power armour; boltguns; bolt pistols; frag grenades; krak grenades. And They Shall Know No Fear; Combat Squads; The Red Thirst. +1 Space Marine Sergeant WS4·BS4·S4·T4·W1·I4·A2·Ld9·Sv3+ bolt pistol; boltgun; melta bombs; power armour; frag grenades; krak grenades; signum. And They Shall Know No Fear; Combat Squads; Combat Tactics. 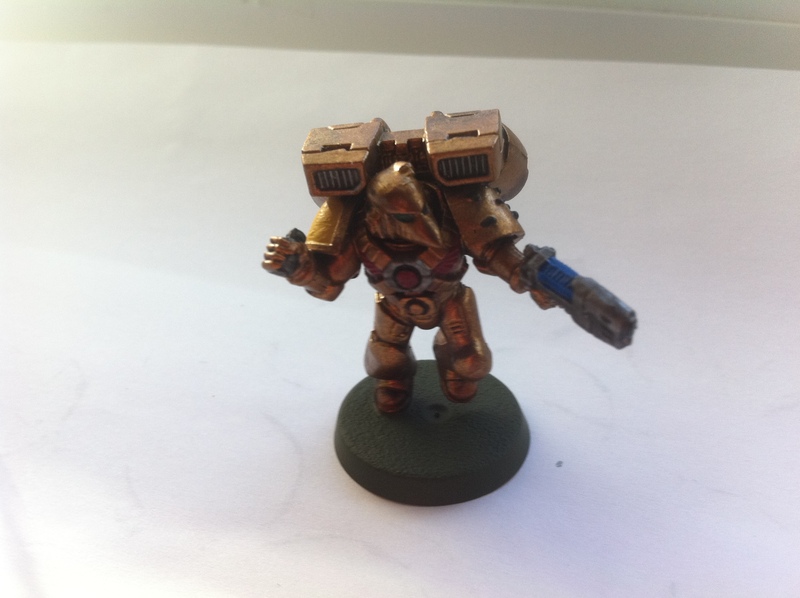 Some of you may have seen my recent post about my DIY Space Marine Chapter, the Brazen Angels. For a while in fact, I was tempted to attempt a combined force mixing the stoic Brazen Angels, with their more mercurial Crimson Avengers. 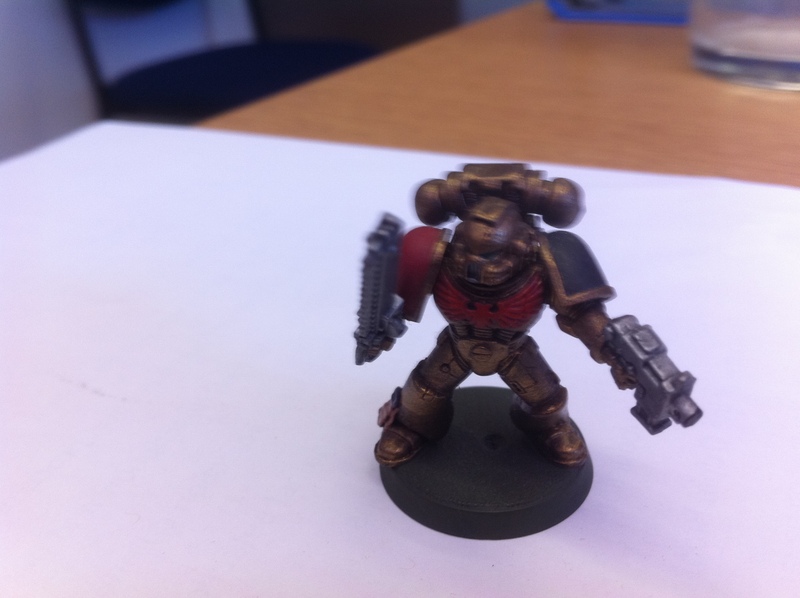 The Space Marine Painter Tool provided by the Bolter and Chainsword forum is an invaluable help to anyone wanting to test how a colour scheme will look but not having any spare test miniatures handy. 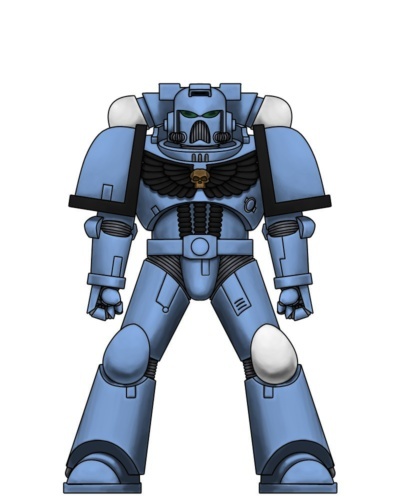 At various points I’ve been considering other Space Marine armies, with a view to creating my own Codex chapter and/or a spiritual Space Wolves successor to complement my Brazen Angels. Some of my ideas are shown below. Possible ‘spiritual’ successors to the Space Wolves I considered included the Storm Crows, Battle Dogs, War Drakes, and Frost Giants. 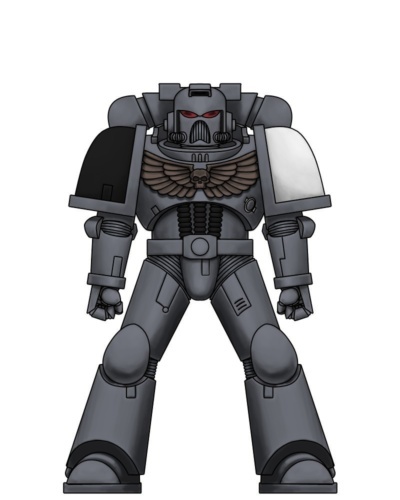 The Storm Crow colour scheme was derived from an alternative Space Wolf colour scheme I once tried. 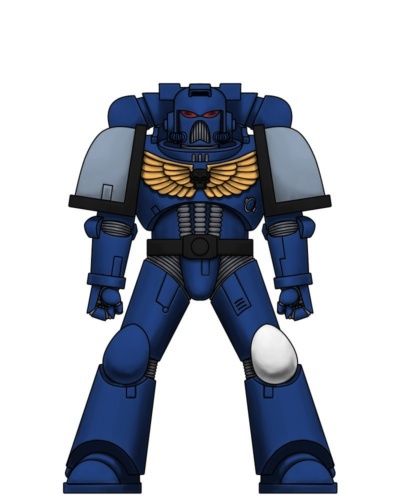 I imagine that the War Drakes would have Salamander gene-seed but whose history would have led them to develop a Space Wolves style organisation. The name Battle Dog was inspired by the name of a Star Destroyer in an Aaron Allston Star Wars Novel. In contrast, possible Codex chapters I considered included the Rooks, the Comets, The Night Hawks, the Sky Lords and the Argent Marshals. Other names I considered for this colour scheme included Steel Gauntlets, Iron Fists, Iron Wolves, Steel Wardens and Silver Stars. The name ‘Rooks’ was actually thought us by a friend many years ago who no longer games. I took the name and tried to imagine a suitable colour scheme. Finally, the Green Knights were my token effort at a Dark Angels successor Chapter. Say what you like about the Space Marines, they do give you an opportunity to use your imagination if you’re so inclined. Sadly, what with one thing or another, I doubt these designs will ever see the gaming table. But I enjoyed playing with the ideas and I hope you find them interesting. As some of you will have read in my previous posts, my big collecting/painting project for the first half of this year was the Brazen Angels, my DIY Blood Angels successor chapter for Warhammer 40,000. The project is currently on hiatus as I have shifted my focus to collecting my fleets for Dystopian Wars and Firestorm Armada. However it was actually an extremely satisfying project and is actually the most successful collecting project I’ve worked on for Warhammer 40k in a good few years. I must admit that what attarcted me to the Blood Angels list was their selection of shiny exclusive toys, in particular the Storm Raven gunship and the Baal Predator tank. I had previously been collecting Space Marine models to use as a Blood Ravens army using the standard Codex Space Marine rules. But seeing the options available to the Blood Angels list I quickly re-purposed those models. I knew however that I wanted to do a successor chapter rather than the Blood Angels themselves as it would allow me to choose a colour scheme I liked and have some input to the iconography I used. Also, after years of eschewing ‘home brew’ chapter creation I suddenly felt motivated to invent something of my own. The original Brazen Angel was one of a half dozen or so test models I painted up to try out different colour ideas. Not all of them were particularly well thought through, but a couple I was quite pleased with. I’ve always liked the idea of bronze painted Space Marines so this was a good opportunity to test what it would look like. The black and red shoulder pads were chosen because they contrasted well with the bronze, but the red chest eagle was intending to be a deliberate reference to the red of the Blood Angels. Once I had decided that I wanted to take the colour scheme forward, I spent a lot of time trying to think of a good name for the chapter. A lot of the time this took was due to an initial determination to crowbar the word ‘praetorian’ into the name. I wanted to avoid the use of ‘blood’ in the name too, as I thought that was a bit too obvious and unoriginal in a Blood Angels successor. In the end I chose ‘Brazen Angels’, which I actually really liked, and had the virtue of being simple and still referencing the parent chapter, but not in the obvious way. 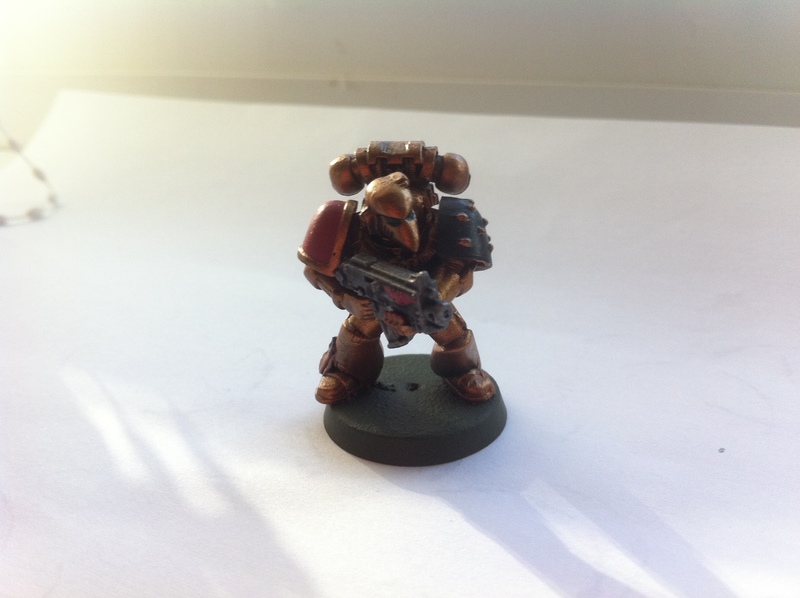 The colour scheme was originally Tin Bitz, highlighted with Dwarf Bronze and Shining Gold. However, expediency and/or laziness led to be changing it to Humbrol bronze spray paint, shaded with Devlen Mud and then highlighted with Shining Gold. I must admit that so far, the army lacks much in the way of Blood Angels-esque decoration, or signature items such as the Infernus Pistol. This is largely because most of them were originally assembled as a Codex army. Over time though, I might be able to remedy this. Like all projects, the ideas had to develop as work went on. After painting up three tactical squads it was time to paint up my assault squad. This forced me to consider whether to introduce the traditional yellow markings of assault squads into the design. 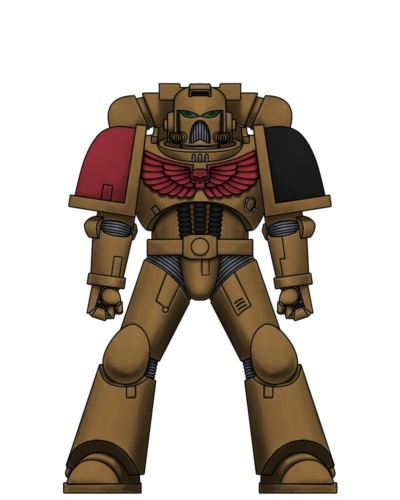 After due consideration, the red shoulder pad of the models painted so far was retroactively designated a ‘tactical’ marking and the assault squad instead were painted with shoulder pads in assault yellow, but retaining the all important red chest eagle. When I paint up my devastator squad they will have blue shoulders. 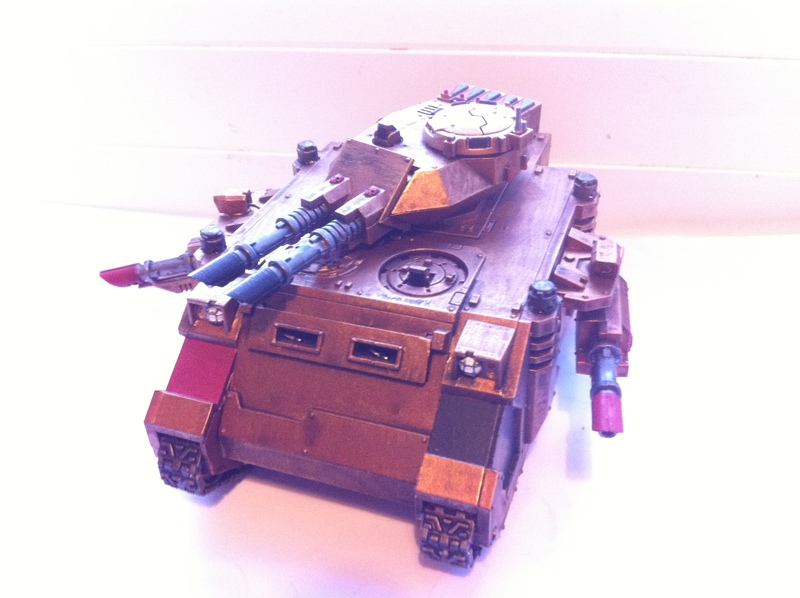 My original plan for the army was to make use of the fact that the Blood Angels list allowed Land Raiders to be taken as dedicated transports to design an= 3000 point armoured heavy assault force based around tactical squads in Land Raiders supported by a Baal Predator and Predator Annihilator as well as another squad in a Storm Raven with mobile backup coming from a deep striking assault squad and some Land Speeder Tornadoes. Since that original plan however, I came to the decision to step back from Games Workshop games and products owing to their ever rising prices and my feeling that I was getting less and less value for money. As result I have scaled back my plan to a more modest 2000 point force. I will be making the last two purchases necessary to complete this force soon, and as things stand, they may be my last purchases from GW for some time. Nevertheless, I’m pleased with the army I’ve designed and very happy to have actually more or less completed a 40k army for the first time in quite a few years. Once everything is assembled and painted I hope I will be able to take the army for a spin or two on the gaming table. I think building an army of my own invention really helped motivate me to get the army properly collected and painted and I think made it a more treasured possession than some I’ve had in the past. Certainly I wasn’t tempted to sell my models off like I was with other GW odds and ends I’ve got lying around. My painting room is currently stuffed with miscellaneous stuff that will be there until the decorators have finished. This means that the chance of me getting anything painted up for ‘Miniature Monday’. So instead as a (hopefully) nice treat for my wargaming pals I am posting the background I wrote for my ‘DIY’ Blood Angels successor Chapter for Warhammer 40k -the Brazen Angels. I have been working on this army since the beginning of the year and it’s the closest I’ve gotten to a completed GW army in about six years. Those of who who read my previous blog post will know that I recently decided to take a step back from GW due to their rising prices and falling quality of service. That said, I will be buying the few models necessary to bring this army up to a nice round 2000 points which I will hopefully be able to take for at least a few games amongst friends. Special thanks go to @CaitoGalenus for beta reading the text and making a few creative suggestions that helped a great deal. The 22nd Founding in the final years of M36 saw creation of over twenty new Chapters of Adeptus Astartes. The majority of these Chapters were fleet based to better tackle the increasing threat from highly mobile raider forces of the Dark Eldar and Traitor Marines, as well as the growing number of Waaaghs encroaching into humanity’s realm. Amongst their number were the Brazen Angels, created from the gene line of Sanguinius and tasked with patrolling the dark places between the disparate worlds of the Ultima Segmentum. 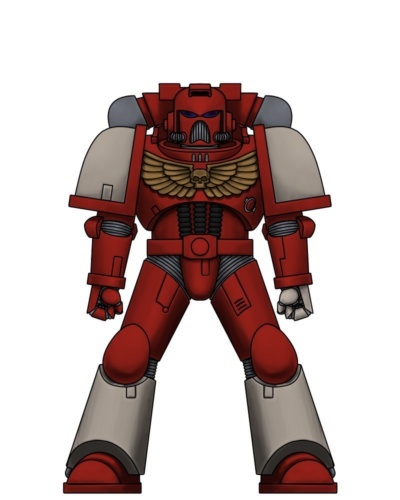 Its first and greatest Chapter Master was Gideon Malthus, formerly first captain of the Angels Encarmine. Malthus had already been the salvation of countless worlds in his three hundred year service to the Emperor. After choreographing the crushing defeat of a Word Bearer war band who had an entire sub-sector enthralled, Malthus earned the attentions of the high lords of Terra who urgently sought a proud, noble and brilliant commander to nurture a new chapter blessed with Sanguinius’ blood. Malthus was given permission by his former lord to select ten of his most capable and seasoned veterans, who saw the bloodiest fighting in the war against the Word Bearers – those who had seen the unmasked face of Chaos and did not break, to take command of the chapters fledgling companies. The new Chapter Master was sworn into his office in a ceremony aboard the battle barge Sanguine Praetorian. A relic of the Golden Age, the Praetorian had been painstakingly returned to its former glory after a restoration lasting nearly millennia. The Praetorian would become Malthus’ flagship and it was upon this mighty vessel’s bridge that he vowed in the name of his Emperor and Primarch to protect the people of the Imperium from the mutant, the daemon and the alien. Malthus took the oath without a pause and with pride in his hearts. His newly appointed captains bore witness to the moment alongside representatives of the Holy Ordos of the Inquisition, the Departmento Munitorum and the Administratum Terra in high anchor above the feudal world of Falchion Primaris. This world would become the primary recruiting world for Malthus’ chapter. Falchion Primaris was home to households of knightly orders who constantly vied for dominance on open plains of battle at the head of highly disciplined and organised armies. The brazen armour of the baronial dynasts at the head of these households inspired the chapter’s colours and name. With such a strong martial ethic – a life of drill, skill at arms and metallurgy – it took less than a decade for Malthus’ captains to have aspirants of sufficient health and skill to form into a force able to support a taskforce of the Silver Skulls Chapter crusading against a Genestealer cult on distant Nova Augusta. Although the Brazen Angels were predominantly limited to scouting missions, interference raids and rearguard duties it taught its aspirants much, not only about the true face of war but what it means to be Astartes. Chapter Master Malthus would eventually fall in battle against the Word Bearers, their Dark Apostle, Marius Doomsayer, avenging himself against the Captain who had once reduced all his works to ash. Command passed to First Captain Josiah Bentham who in turn avenged his late Master within the week. Malthus however would be interred within a Dreadnought and would continue to act as advisor and spiritual figurehead to the Brazen Angels for a further two millennia. Malthus finally took his place at the Emperor’s side at the battle of Corinthia, a world fallen foul of daemonic infestation. At the wars climax Malthus engaged the foul Daemon Prince, Riventhrax, in mortal combat. Although hopelessly outclassed, Malthus managed to keep the daemon occupied long enough for a contingent of Grey Knights to banish the beast back to the warp. It is said that his name is inscribed on the wall of the fallen within the tombs of the Grey Knights sanctuary on Titan. The Brazen Angels are a fleet based chapter with no permanent home save for their fleet of strike cruisers and battle barges. The spiritual centre of the chapter is the flagship Sanguine Praetorian which houses the Chapter Reclusium and the household of the Chapter Master. The Librarium however is centred upon the battle barge Preceptor Encarmine. Each company is housed aboard a strike cruiser, save the tenth company who are split between Sanguine Praetorian, and the Chapter Keep on Falchion Primaris, set deep within the Halo Mountains, the lasting memory of a past age when a great comet struck the world. Within the encircling walls the Chapters recruits undergo psychic and spiritual scrutiny by a small cadre of Apothecaries, Chaplains and Librarians, all under the watchful gaze of the 10th company captain – usually the most grizzled and most exacting member of the Chapter Council, who will have seen the very worst the galaxy has to offer and lived to talk about it. Should the aspirants survive the gruelling and invasive testing they begin the first stages of the change to become full Space Marines. Those more experienced members of the 10th company who are fully fledged scouts are split between the fleet and Falchion Primaris. Those at home, aside from rigorous arms training, are also charged with the protection of the planet itself from threats foreign and domestic. Through this all Brazen Angels understand what it means to be just in an unjust universe. The Chapter recruits come almost exclusively from Falchion Primaris. The world is a temperate, late-stage feudal world governed by an official known as the Steward, appointed by the Chapter Council to rule in their name and protect the Chapter’s interests and the Emperor’s subjects. The citizenry themselves revere the Emperor in an ethereal state – a being always watchful and in all places, the chapter master being akin to his holy emissary, and to whom the warlords ultimately do homage, even as they compete amongst themselves for land and power. The Chapter Master will routinely return to ensure that his will is being done and that his Steward is being shown the respect due an agent of the Chapter. 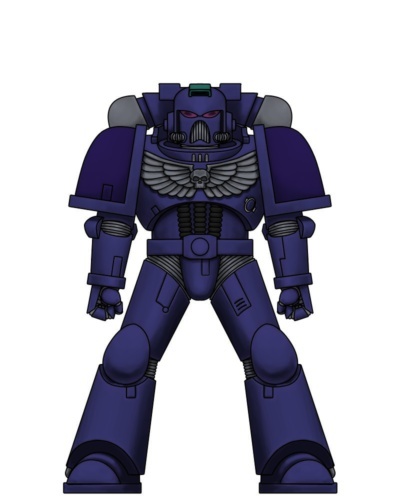 The dynastic conflict is tolerated by the Imperium so long as it does not endanger or impede the Emperor’s interests on that world and continues to generate young warrior-prodigies for entry into the Brazen Angels. 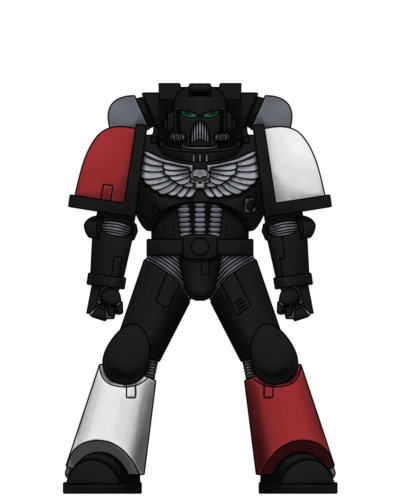 The chapter master oft tasks the orders with the elimination of threats to Imperial interests such as bands of brigands or the slaying of migrating herds of dangerous rockdrakes who are known to be drawn to populated areas in search of food. The knights and squires of the orders are expected to take oaths in the God-Emperor’s name to protect the innocent and not allow bystanders to come to harm and thus their wars seldom escalate beyond pitch battles, lasting long enough for honour to be satisfied. Once per year – at the vernal equinox – the chapter’s Chaplains and Apothecaries stand upon the plains leading to the Halo Mountains – an area known as Gideon’s Reach – beneath a crimson banner awaiting young squires and errant knights. Only those that have successfully travelled from their homes alone and unaided to the plains are of interest to the chapter. Only those strong of mind as well as body are fit to compete in the trials to prove themselves worthy of serving the Emperor’s holy messenger amongst the stars. Only the most promising are chosen for the opportunity to become an Astartes, though the chapter’s officers frequently return with other promising youths who have been judged to have the potential to serve the chapter in other ways, such as starship crew or defence auxilia. The rest, having forsaken their old lives, take the limited solace offered in entering service in the Steward’s household, where they are able to still serve their Emperor, albeit in a far lesser capacity. Recruits are sworn to the service of the chapter and the Emperor and commanded to set aside the allegiances of their past, whether they be to an order, liege or homeland. An aspirant or novitiate who acts upon a grudge dating back to their old lives can expect swift punishment, which can prove fatal should the offence re-occur. The Brazen Angels adhere closely to the Codex Astartes, save in those areas where the traditions of the Blood Angels and their successors have taken precedence. Chapter Master Gideon worked hard to inculcate the ways of Sanguinius into his new Chapter. Inevitably however, the Brazen Angels have taken on their own identity, adapting their traditions and heraldry over the centuries. 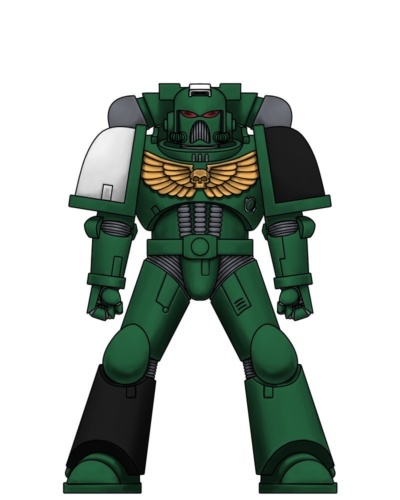 The most notable quirk of the Brazen Angels’ combat doctrine lies in their Chapter’s Death Company. The Brazen Angels’ disquiet at the flaw within their gene seed is as acute as that of any of their brother chapters, if not more so. The traditions of Falchion Primaris in particular have encouraged an abhorrence of the collateral damage that can result when the Red Thirst or Black Rage strike a battle brother. As such, the Brazen Angels limit the use of their Death Company to situations where deploying their afflicted brothers poses no risk to allies or innocents. Great stasis wards have been constructed aboard the Brazen Angel’s fleet to contain afflicted brothers when their deployment is not possible. When the time is right however, these lost souls, each in their individual stasis casket are loaded into drop pods and gunships under the supervision of a chaplain, ready to be released against the enemies of mankind without risk to those the Brazen Angels have sworn to protect. Though the Brazen Angels do not often deploy their Death Company, when they do so it as a large and nigh unstoppable force. Captain Baemner, who commanded the Brazen Angels at the Battle of the Basalt Plateau likened their Death Company to ‘a howling tide of black and brass, sweeping the greenskins before them like a storm’. The Brazen Angels’ patrol routes through Ultima Segmentum frequently bring them into conflict with Traitors and Renegades sallying out from their lairs in the Maelstrom. Their frequent brushes with Chaos Space Marines had motivated the battle brothers of the Brazen Angels to prepare themselves for facing their corrupted former brethren. 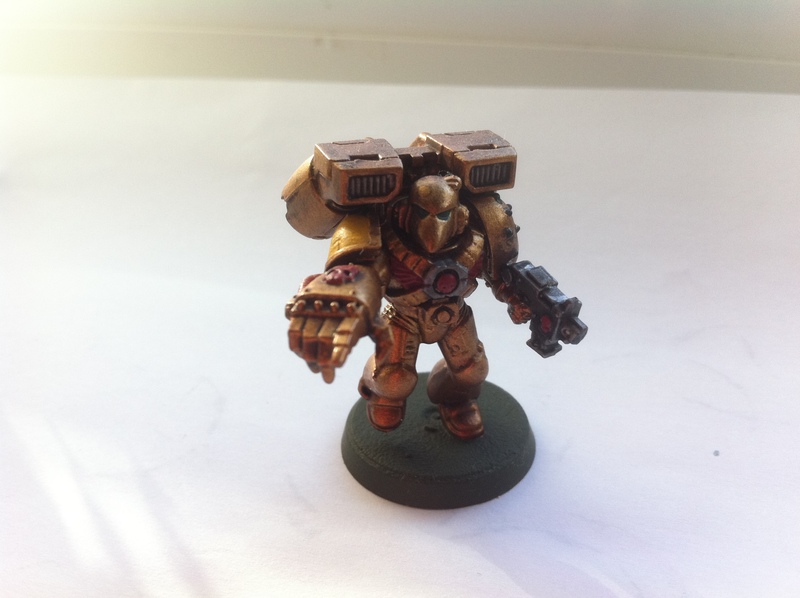 Plasma guns are a common sight in Brazen Angel squads and a higher proportion of veteran brothers than in other Sanguinian chapters opt to serve in Sternguard squads rather than Vanguard. One of the Brazen Angel’s most successful campaigns was fought against the Renegades of the Word Bearers, fighting alongside the Crimson Avengers, a brother Chapter of the Sanguinian line. Together the Brazen Angels and Crimson Avengers brought ruin on the forces of Dark Apostle Gais Soulcager – former lieutenant to Malthus’ old nemesis Marius. In the aftermath the two chapters pledged eternal brotherhood and have fought together a score of times since. Another great victory was when the Brazen Angels fought in the Siege of St Sebastian’s Hive alongside the Rooks, Storm Crows and Frost Giants. The Brazen Angels held Malcador Gate against a force of Orks that outnumbered them twenty-five to one. Like all Space Marine chapters the Brazen Angels venerate their Primarch and the Emperor above all, looking to the tales and legends of those great heroes for guidance and inspiration. The Brazen Angels have inherited the traditions of their forebears and their beliefs and customs are kept by their Chaplains, Librarians and Sanguinary Priests as in all Blood Angel successor chapters. As with other chapters however, they have also been shaped by the beliefs inherited from their recruiting world. The Imperial cult on Falchion Primus was shaped by the spartan, militaristic ways of that world, which in turn inspired a similar spartan way amongst the Chapter. The Chaplains of the chapter preach that devotion to the Emperor is best expressed through duty rather than outward piety. Prayer and meditation are encouraged as a means of developing self-control and self-reliance but the Chapter’s ceremonies are notably less elaborate and the Astartes of the Brazen Angels believe in demonstrating their devotion rather than proclaiming it. The knights and squires of Falchion Primaris embrace a code that encourages them to protect the innocent even as they made war on their enemies. This ethos has in turn shaped the chapter of marines recruited from that world. The Brazen Angels conceive of themselves as defenders first and foremost and as such are quick to answer calls for aid and actively patrol in search of heretics, Orks or other xenos raiders in hopes of intercepting them before they fall upon Imperial worlds. In contrast, the chapter rarely commits its forces to prolonged crusades, lest their forces become mired in a grinding conflict that will sap their strength and prevent them defending worlds elsewhere. This approach to warfare also makes them staggeringly adept at ship to ship boarding actions, preferring to take the fight to the enemy rather than allowing them to sully Imperial soil. Their relatively limited supplies of Terminator armour has forced the chapter to instead maximise the utility of their Sternguard units and develop an incredibly disciplined approach to war at odds with the near frenzy that some other sons of Sanguinius exhibit. Additionally the Brazen Angel chapter masters have written dozens of lengthy tomes on xenos fleet tactics as well as shipboard assault tactics some of which have become required reading amongst other Space Marine Chapters, and are ranked alongside such definitive works as Ultramarines first captain Agemman’s treatise on the use of timed fuse bolt shells in zero gravity enclosed environments. The Brazen Angels are one of the most recent chapters created from the Blood Angels’ line. Since their founding the Imperium has become increasingly wary of utilising this geneseed in the creation of new chapters. The Brazen Angels are all too aware of the flaws and their Apothecaries are vigilant in their efforts to prevent further degeneration. The genetic purity of the people of Falchion Primaris is screened by the Chapter Keep’s Apothercarin on behalf of the chapter to prevent anomalies entering the geneseed pool from outside. The Brazen Angels don’t have a battle cry as such. Because to their brotherhood duty is faith they approach war with a monastic resolve, uninterested in the bluster inherent in battle cries. The Brazen Angels prefer deeds to words and do not feel the need to loudly proclaim their intention to do their duty, but instead to do it with lethal efficiency. Friend and foe alike find their taciturn approach to warfare unnerving, especially in contrast to their hot blooded gene brothers such as the Crimson Avengers, and some more militant chapters misinterpret their approach as a sign of insufficient fervour. The Brazen Angels in turn consider the elaborate pre-battle rituals of some Chapters to be indulgent and vainglorious. Their allies are often unaware however, that before battle proper is joined, the Brazen Angels Chaplains and Captains will share their rhetoric with their brothers over a private vox-channel, the battle brothers in turn renewing their oaths to their Primarch. Thus, to the Brazen Angels, all that needs to be said has been said.